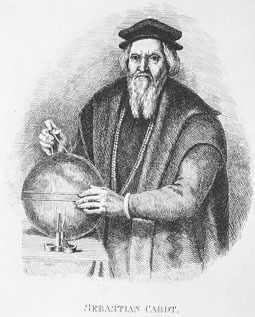 Sebastian Cabot, son of explorer John Cabot, is not independently heard of until May 1512, when he was paid twenty shillings "for making a carde of Gascoigne and Guyenne", to where he accompanied the English army sent that year by King Henry VIII to aid his father-in-law Ferdinand of Aragon against the French. Since Ferdinand and his daughter Joanna were contemplating the dispatch of an expedition from Santander to explore Newfoundland, Sebastian was questioned about this coast by the king's councillors. As a result Ferdinand summoned him in September 1512 to Logroño, and on the 30th of October appointed him a captain in the navy at a salary of 50,000 maravedis a year. A letter was also written to the Spanish ambassador in England to help Cabot and his family to return to Spain, with the result that in March 1514 he was again back at Court discussing with Ferdinand the proposed expedition to Newfoundland. Preparations were made for him to set sail in March 1516; but the death of the king in January of that year put an end to the undertaking. His services were retained by Charles V, and on the 5th of February 1518 Cabot was named Pilot Major and official examiner of pilots. In the winter of 1520-21 Sebastian Cabot returned to England and while there was offered by Thomas Wolsey the command of five vessels which Henry VIII intended to despatch to Newfoundland. Being reproached by a fellow Venetian with having done nothing for his own country, Cabot refused, and on reaching Spain entered into secret negotiations with the Council of Ten at Venice. It was agreed that as soon as an opportunity offered Cabot should come to Venice and lay his plans before the Signiory. The conference of Badajoz took up his time in 1524, and on the 4th of March 1525 he was appointed commander of an expedition fitted out at Seville "to discover the Moluccas, Tarsis, Ophir, Cipango and Cathay." The three vessels set sail in April, and by June were off the coast of Brazil and on their way to the Straits of Magellan. Near the La Plata river Cabot found three Spaniards who had formed part of De Solis's expedition of 1515. These men gave such glowing accounts of the riches of the country watered by this river that Cabot was at length induced, partly by their descriptions and in part by the casting away of his flagship, to forgo the search for Tarsis and Ophir and to enter the La Plata, which was reached in February 1527. All the way up the Parana Cabot found the Indians friendly, but those on the Paraguay proved so hostile that the attempt to reach the mountains, where the gold and silver were procured, had to be given up. On reaching Seville in August 1530, Cabot was condemned to four years' banishment to Oran in Africa, but in June 1533 he was once more reinstated in his former post of Pilot Major, which he continued to fill until he again removed to England. As early as 1538 Cabot tried to obtain employment under Henry VIII, and it is possible he was the Sevillian pilot who was brought to London by the king in 1541. Soon after the accession of King Edward VI, however, his friends induced the Privy Council to advance money for his removal to England, and on the 5th of January 1549 the king granted him a pension of £166 13s. 4d. On Charles V objecting to this proceeding, the Privy Council, on the 21st of April 1550, made answer that since "Cabot of himself refused to go either into Spayne or to the emperour, no reason or equitie wolde that he shulde be forced or compelled to go against his will." A fresh application to Queen Mary I on the 9th of September 1553 likewise proved of no avail. On the 26th of June 1550 Cabot received 200 pounds "by waie of the kinges Majesties rewarde", but it is not clear whether this was for his services in putting down the privileges of the German Merchants of the Steelyard or for founding the company of Merchant Adventurers incorporated on the 18th of December 1551. Of this company Cabot was made governor for life. Three ships were sent out in May 1553 to search for a passage to the East by the northeast. Two of the vessels were caught in the ice near Arzina and the crews frozen to death. Chancellor's vessel alone reached the White Sea, whence her captain made his way overland to Moscow. He returned to England in the summer of 1554 and was the means of opening up a very considerable trade with Russia. Vessels were again despatched to Russia in 1555 and 1556. On the departure of the "Searchthrift" in May 1556, "the good old gentleman Master Cabot gave to the poor most liberal alms, wishing them to pray for the good fortune and prosperous success of the 'Searchthrift'; and then, at the sign of the Christopher, he and his friends banqueted and made them that were in the company good cheer; and for very joy that he had to see the towardness of our intended discovery, he entered into the dance himself among the rest of the young and lusty company." On the arrival of King Philip II in England Cabot's pension was stopped on the 26th of May 1557, but three days later Mary had it renewed. The date of Cabot's death has not been definitely discovered. It is supposed that he died within the year.